Many of our users have asked how they should access LastPass when away from their home computer, and how to stay safe on the road when using riskier public terminals at libraries or Internet cafes. Here are some tips, tricks, and general overviews on how to get LastPass set up on your USB drive so you can take your favorite password manager everywhere. LastPass Portable is an ideal way to access your LastPass account while on the go. After installing a portable browser, which is essentially a fully-featured browser formatted for a thumb drive, you can install the LastPass plugin to give you the same password management experience you're accustomed to on your desktop or laptop. 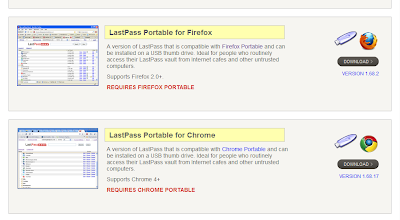 With Portable Firefox and Chrome versions for Windows, Mac, and Linux, LastPass Portable gives you the ability to browse with LastPass on nearly every operating system. 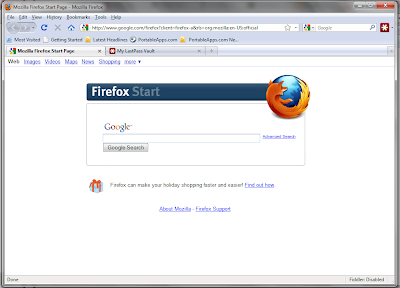 Firefox Portable and Chrome Portable for Windows and Linux can be downloaded from PortableApps.com, while other sites offer downloads for Mac. 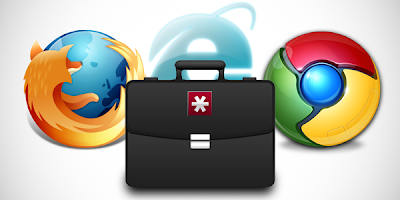 Once the portable browser has been installed on your computer, you can launch it and navigate to the LastPass download page, where you can locate the corresponding LastPass Portable app. 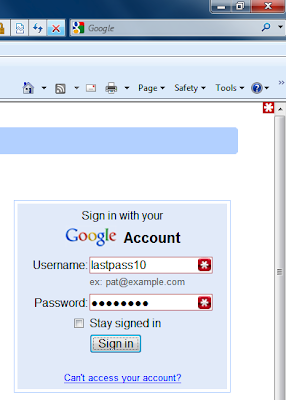 You can then install the LastPass addon as you would in any of your desktop browsers. Once installed, you can drag and drop the portable browser file onto your USB thumb drive and launch it from there when on a new computer. Another plus side of using the portable browser is that you won't be leaving behind any record of accessing your LastPass account - no browsing history, cookies, or other locally-stored files to be concerned about. Now you can literally browse on the go with LastPass! If you commonly use Windows with LastPass, another option you may consider is IE Anywhere, which allows you to hook into Internet Explorer from the USB thumb drive. It's essentially a standalone plugin that, when launched with IE, displays a little icon in the browser window and allows you the same functionality as the desktop plugin. For users who aren't able to download plugins to their computer - common in the workplace - IE Anywhere lets you access and use your LastPass account, with the added benefit of leaving no files behind. IE Anywhere also gives you the ability to run LastPass on unsupported browsers like IE Tab in Firefox, Sliepnir, and Maxthon. After downloading IE Anywhere, the file can be dragged and dropped to the USB thumb drive. When you plug your thumb drive into your computer's USB port and double-click to launch the file, the LastPass icon will appear in your system taskbar. Clicking on the icon allows you to login, and from there you can launch IE to access all regular features of the LastPass addon. When you're done browsing, simply click the taskbar icon, select "Logoff", and eject your USB drive. No data left on the computer, no files created, nothing in the registry, and no plugin left behind! If you simply want a backup of your LastPass data or basic access to your usernames and passwords, LastPass Pocket is a stand-alone application providing storage capability and offline access of your LastPass vault. Pocket is intended to be used when you don't have an Internet connection, which is why we recommend LastPass Portable and IE Anywhere for a richer browser experience. Pocket can be installed from the download page for Windows, Mac, or Linux and then dragged and dropped onto your USB drive. You can double-click the file to launch it from the USB drive, prompting you to login to your account. After logging in, Pocket decrypts your data and displays all of your sites and Secure Notes in a searchable interface. Pocket comes with limitations, though. Although you can copy/paste all login elements of your saved sites or Secure Notes, you can't edit or delete any data that has been synced to Pocket, which makes it less functional for maintaining your vault. 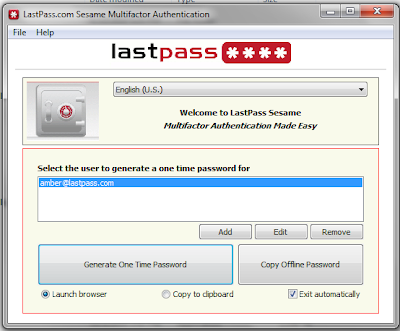 If you want to up the security of your LastPass account, consider using a second-factor authentication like Sesame, which can be run from your USB drive. Sesame protects your account by requiring the generation of One Time Passwords (OTPs) before you can complete login to your vault. The basic idea is that, even if someone were to grab your master password via keylogging or some other malware, they still won't have access to your LastPass data because they won't have the Sesame OTPs. Sesame for Windows, Mac, and Linux can all be run from the same USB stick, so you'll never be locked out of an operating system where you need to access your data on the go. Sesame can be downloaded from the main download page, then dragged and dropped onto your thumb drive. You need to activate Sesame the first time it's launched. Once enabled, Sesame will create secure OTPs that are subsequently required to login to your account. You have the choice to copy the OTP to the clipboard or launch your browser of choice and pass the value automatically. If you prefer to use Grid, another option is to save the CSV file of your Grid set on your USB thumb drive so you can easily login to your account while on public computers. With so many options for taking LastPass on the go (we didn't even cover the mobile apps), you can rest assured that you'll have secure access to your data from nearly anywhere. Head on over to the download page today to get started with any or all of the above features, and begin prepping your USB thumb drive for your next trip!